Many people often wondered if changing their career to become a data scientist is worth the shot. Especially for those who have a technical background in web development, programming etc, as they feel confident that the transition will not be as difficult with their prior knowledge and skills. But is this really true? And what is the future ahead of you when you decide to become a data scientist? 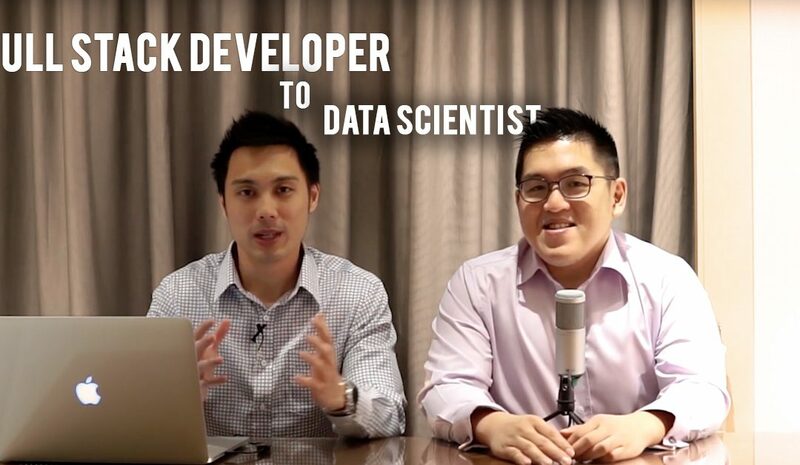 Dr Lau, who is our Chief Data Scientist and Mentor at LEAD, first started out his career as a developer shares his experience and advice on this topic. Is technical background an advantage to enter data science? What is the correct mindset if you are looking to learn data science? What is next for you after you become a data scientist? Is there an advantage for people who have a technical background to go into data science? Reuben: Let’s talk about full-stack developers who turn into data scientist. Is it an advantage for someone who have a technology background to go into data science? Dr Lau Cher Han: If you don’t have a technical background, You’d be thinking, “I cannot become a data scientist because I don’t know how to program”. This is a common question I get asked most of the time, and we have even discussed it in previous episodes as well. Here is the truth. Is having the technical skills an advantage? Yes! In a layman’s example, If I know Mandarin, it would be easier if I decide to learn Japanese or Korean. Yes, it is definitely an advantage. But that doesn’t stop someone who is English speaking to also learn Japanese or Korean. It’s the same concept. So, if you know how to program, it makes it easier for you to enter data science as you know the tools already. But if you are passionate about data science and you have no background, that should not stop you from learning. But on top of that, things like the variables, writing IF statements, writing loops, those are all the same. The basic logic is the same, so if I were to take this a little bit further, I would say, yes, if you already know how to construct a program, and you have the knowledge to write programs, that will give you a little bit of good head start. How long it would take to learn Python? But in order to get yourself familiarised with Python data scientist tools, that itself would take three months to learn, which is the same amount of time for somebody who has no technical background. So it is on a leveled playing ground. For developers and programmers who have some technical background, where can they get datasets to practice on? Reuben: 12 hours per week, so that is about 1 – 2 hours per day. What kind of things do you think programmers or developers who have some technical background should practice on? And where can they get this data to practice on? Dr Lau: I should ask you this question, given that we have been working on these topics together for awhile. Where is the number one website I recommend people to go when it comes to data sets? Dr Lau Yes, Kaggle! Just go on to Kaggle to get real-world data sets. Most people, when looking for things to learn, they often look from the tools perspective. Let me give you an example. Say, today if I say, “come I’ll teach you how to use a screwdriver”, or “Come, I’ll teach you how to use a drill”, you won’t be interested. But rather, if I ask you, “would you like to build a small wooden house?”, to which you can use it as a gift or something, then it’s very different and you will be more likely to be interested to learn. The same thing, when you try to get a data set, your mindset should not be on learning a specific programming language, but rather, you need to think of the actual reason to why you would like to analyse the data. For example, you can start with learning how to predict the actualization rate for your company’s employees, or the people who would die in a titanic disaster etc. then you can use the tools to practice solving the problem. Reuben: This concept applies to a lot of different learning process, and not just data science, but rather a lot of different things you learn as well. What is the advantage for people who move to data science, in terms of money? Reuben: We talk about people who have tech background moving to data science, what are the advantages for people to move over, in terms of money? Dr Lau Cher Han: Whenever we talk about data science and presentations, one thing that comes to mind is the last mile delivery, and the last mile is the presentation. So no matter how good is the model or the analysis, or even the results, the last thing you have to do is to present it to somebody, like your stakeholders or your target audience. On top of that, the soft skills you need to have is storytelling, to which we discussed it in previous episodes, the skills you need to build a dashboard. When it comes to production data science, you need to build a dashboard. For those with no programming background, they have to build it by using things like tableau or excel. These programmes are very limiting and time-consuming. So if you know how to do web development, you can take your results and put it on your dashboard then you can release it as a website. And there are a lot of free tools that allow you to create stunning visualisations that are highly interactive as well. Are salary and status the main reason people shift to data science? Reuben: In your experience, when someone switches from a web developer to becoming a data scientist, is that normally fuelled by the desire to drive more income, or get better salaries? Is that a normal desire? Dr Lau Cher Han: I wouldn’t say no, especially in the Asian culture. Many of us are driven by income and status. However, this motivation is very short term. You will not be able to stay motivated for ten or twenty years of this career, just based on money. But if you were to only think about money, then it would just be another job. After a while, you will be searching for the next job which pays better. But data scientist careers are very exciting, and it gives you a promising career prospect. You start off as a data engineer, and then an associate and move on to junior data scientist and finally a data scientist, and even the chief data scientist if that is what you want to do. Reuben: So we shouldn’t take money as the main goal, but rather, money should be the by-product of everything that we are doing in the field. What is next after becoming a data scientist? Reuben: I am going to jump the gun a bit further, we talk about being a data scientist. What comes after becoming a data scientist? Where do you see data scientists heading to? Dr Lau Cher Han: So a lot of my peers, as well as myself, started off with data mining. We do a lot of number crunching, analysing work etc. After 5 – 10 years in the industry, then we parted ways to venture into different things. Some of them choose to become researchers, or engineers in the R & D department. Given the industry right now, there is a lot of possibility to become an AI engineer, or a machine learning engineer, to work on those algorithms. So that is one possibility. Data science skills allow you to go into different verticals, and you can choose the areas that you want, which can be automotive, e-commerce, retail or manufacturing etc. So you wouldn’t be limited to a particular vertical, unlike other engineers. If you are a chemical engineer, it is very less likely you will switch to do mechanical engineering. Is there a big difference to doing data science in different verticals or industries? Reuben: If you do data science in different verticals, it will be a very different experience altogether. Do they have to relearn a lot of things, or will it be a very big shift between those verticals? Or is it somehow correlated, where we can actually borrow a few skills from here and there and mix it around? Dr Lau Cher Han: I would say, the fundamental skills are the same. For example, the way we analyse the data, the technical skillset etc, are the same. But if you want to become an outstanding data scientist in the particular industry, you definitely need to have knowledge in the particular field. However, I have also seen exceptional cases, where there is a prolonging problem, and people in the industry have grown to accept it the way it is. They stop thinking about innovations or new ways to do things. Then a data scientist from a different field enters, and because they are not familiar with it, they actually have a fresh new perspective that can analyse the data differently. Do you think data scientists need to have strong communication skills in order to speak to stakeholders? Reuben: Do you think data scientist have to be able to speak up to stakeholders? Imagine they go into an industry, where they have no experience with data science at all. When you enter, you are directed what to do, instead of being able to direct them what do do. So do you think data scientist needs to be able to have good communication skills? Dr Lau: So for those who do not know, I am an introvert. But because of data science, you have to do a lot of communication, and I have learned over the years to be able to communicate better. However, the good thing about data science is when you are communicating, it is not based on a gut feeling or opinions or even experience. But rather, your discussions are data-driven and supported by evidence and facts. This is why it makes me confident to speak up, especially with people who are senior to me. With those figures supporting you, you will not be so intimidated to speak up. Even with very traditional clients, as much as they have a strong mindset of their own, they know that numbers don’t lie. So they will also learn to slowly open up, adapt and embrace this sort of data science, as they know this can help to sustain and scale up their business in the future. If you are a programmer or developer, or even someone with some form of technical background and you are planning to venture into data science, what other concerns or questions you would like to know? Do let us know in the comment sections and do Like our Facebook page and subscribe to our YouTube channel for more content like this.